Neurotransmitters shape neuronal activity by regulating ion channel function through direct binding or through G-protein-dependent signaling cascades. In the latter case, neurotransmitters can regulate multiple channels simultaneously, leading to complex and sometimes surprising effects. Carver and Shapiro have found such unexpected effects mediated by M1 acetylcholine receptors (M1Rs) in granule cells of the mouse dentate gyrus. In PNS neurons, activation of M1Rs leads to closure of M-type potassium channels, and thus to increased neuronal excitability. Similar effects occur in other neurons, including hippocampal CA1 pyramidal cells. Carver and Shapiro found that M1R agonists also increased excitability and spontaneous spiking in dentate cells. Surprisingly, however, this was accompanied by an increase, rather than a decrease, in M-channel current (IM). How does this occur? M1Rs are coupled to Gq/11 proteins, which activate phospholipase C (PLC). PLC hydrolyzes a membrane lipid, phosphatidylinositol 4,5-bisphosphate (PIP2), to form diacyl glycerol and inositol 1,4,5-trisphosphate (IP3); this in turn triggers calcium release from internal stores. Although these signaling molecules are responsible for many of the effects of Gq/11-coupled receptors, it is PIP2 hydrolysis that underlies IM suppression: M-channels require PIP2 to remain open, so PIP2 depletion closes them. The unexpected increase in IM in dentate cells could be explained, however, if M1Rs stimulate PIP2 synthesis as well as hydrolysis. Consistent with this hypothesis, inhibiting PIP2 synthesis reduced basal IM and unmasked M1R-induced suppression of IM in dentate cells. The paradoxical increase in excitability accompanying enhancement of IM by M1R agonists in dentate cells might be attributable to increases in intracellular calcium levels. But in another unexpected twist, M1R-evoked calcium elevation did not stem from IP3-triggered release from internal stores. Instead, the increase in excitability resulted from PLC-dependent opening of TRPC4/5 cation channels. These results show that, unlike in CA1 pyramidal cells and other neuron types, M1Rs enhance IM in dentate granule cells, likely by stimulating PIP2 synthesis. Despite this effect, M1Rs increase excitability of dentate neurons, because they also promote opening of TRPC channels. These results demonstrate how the effects of neuromodulators are shaped by the many other signaling pathways present in cells. This complexity must be considered when attempting to predict the consequences of receptor activation. The pontine parabrachial nucleus (PbN) is thought to regulate food intake and contribute to homeostasis and threat avoidance. Activity in PBN neurons increases as an animal eats, and stimulation of PbN neurons that express calcitonin gene-related peptide (CGRP) inhibits feeding. CGRP-expressing PbN neurons are also activated by molecules associated with food poisoning and nausea, bitter tastes (which often indicate a substance is toxic), predator odors, loud noises, and nociceptive stimuli. Therefore, these neurons might prevent consumption of noxious foods and suppress feeding when threats are present. However, activity in some PbN neurons increases in response to salt deprivation, and some neurons are activated by salty, appetitive (sweet and umami), or sour tastes (Palmiter, 2018 Trends Neurosci 41:280). The extent to which these populations overlap and their roles in feeding and other behaviors remain unclear. Neurons responsive to sodium (red), electrolytes (green), sucrose and umami (yellow), and bitter tastes (blue) were found in several subnuclei of the PbN. Some neurons (filled circles) in each group responded to stimulation of the spinal trigeminal subnucleus caudalis. 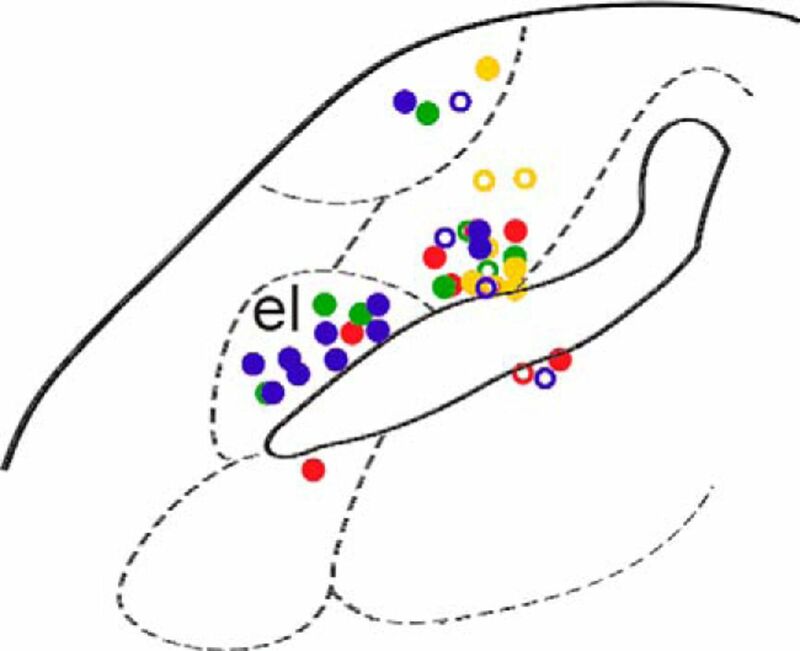 Neurons responsive to bitter tastes, noxious heat, and chemical irritants were primarily localized to the external lateral subnucleus (el). See Li and Lemon for details. Li and Lemon addressed the first of these questions by examining the responses of single PbN neurons to various tastants, thermal stimuli, and chemical activators of TRP channels (capsaicin and mustard oil) applied to the tongue. A cluster analysis grouped PbN neurons into four categories based on which tastants activated them most strongly: sodium, sucrose and umami, bitter molecules (quinine and cycloheximide), and electrolytes more broadly (sodium, citric acid, and quinine). Some neurons in each of these groups (∼70% of all taste-responsive neurons) also responded to electrical stimulation of a spinal trigeminal subnucleus that encodes thermal and nociceptive stimuli from the head; most neurons also responded to thermal stimuli. Notably, whereas sodium- and electrolyte-sensitive PbN neurons were most likely to respond to cool temperatures, many bitter neurons were activated by noxious heat. Furthermore, bitter neurons were the ones most likely to respond to capsaicin and mustard oil, and many were also activated by aversively high salt concentrations. Neurons sensitive to bitter and nociceptive stimuli were found predominantly in the external lateral subnucleus of the PbN. These data reinforce the hypothesis that neurons in the external lateral subnucleus of the PbN are activated by sensory stimuli that signal potential danger, and they show that taste and somatosensory information converges on single neurons. Future work should determine whether these neurons express CGRP and whether they are involved in avoidance behaviors. This Week in The Journal was written by Teresa Esch, Ph.D.